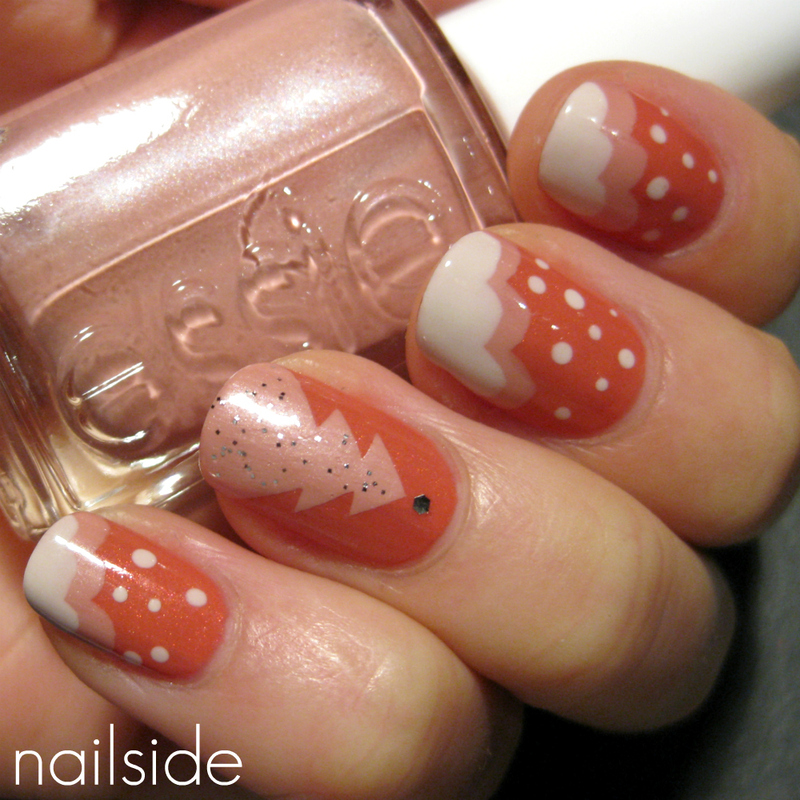 Hi everyone :) For this post I have another Christmas mani. Since I haven't made any Halloween looks this fall, I'm planning on catching up some holiday manis with this year's Christmas ;-) Anyway, this week's been terribly busy, so I've been wearing Essie Your Hut Or Mine for the last three days. But today's weekend, yay! So I finally had time to update my mani. I added a Christmas tree for my accent nail, using tape. You know, if you think about it, a Christmas tree isn't that different from a lightning bolt! I mainly used tape triangles which I placed underneath each other on each side of the tree to create the zigzag lines. For a little sparkle I added silver glitter on top and a larger piece of glitter as my tree topper. On the rest of my nails I made "funky clouds", representing a snow scenery and later I added the "snow" with a dotting tool. In retrospect, I think the dots are a bit too much, so I doubt if I'm going to keep this mani longer than a day. But oh well, that means I can do my nails again tomorrow ^^ Thanks for reading! So cute! I love how it isn't the traditional Christmas colors. i really like this mani ! This. is. so. awesome! It somehow reminds me of a scene from one of those old black and white books that would have a few pages of color, but the color was always just red tones. So creative! OMG absolutely adorable. I love this so muuuch! I really love this - especially your color selection!!!! i lve how subtle yet beautiful and different this it! You kill me with the talent you have! Its adorable! super awesome!! I wish I were that talented as you are! What an unexpected color combination for Christmas! Looks great. Jane this is so incredibly gorgeous! You kill me with your designs! So original and fun! And easy to replicate :-) Awesome! Oh my, adorable, the christmastree! This is so cute! And not a traditional xmas polish colors. fantastically amazing! Love that you didn't use xmas colours but it still looks festive! This is so cute! Gonna try this! How do you do e mani tape for clouds? Oh wow!! This is so perfectly done. Love it! I love this! So lovely and retro--like something you'd see with Rudolph (the tv show). I personally like the dots ;) Beautiful as always!! This is really cute and wintery! Even if it doesn't have traditional Christmas colors. Love it! This is gorgeous! I like that you used neutral colors as opposed to the typical red, green & blue! This is amazing lve the colors you used and pink is never a bad idea! Ziet er zo schattig en mooi uit! super cute and i love it doesnt have the regular christmas colors, it looks awesome! Those nails are awesome! I love the nontraditional colors. Btw...I picked you for the Top 10 Award! This is simply beautiful! I love the idea of being able to make those colors work for a Christmas nail design! it's so cute! I'm loving all the christmas manis I've been seeing. I love the taped tree, very creative! How do you manage to cut the (cloud/tree/everything else u've done) tapes in the same shape all the time?! Super duper cute! I love the designs and the color combo it's all very very nice! What a pretty man!! And such a unique color for Christmas! I love it. Ahhh these are soo lovely. And I especially like that you didn't use 'Christmas' colours, so really bringing it up to date. Can you make a tutorial about these "clouds" or "snow"? Love it, this is my fav winter design yet! That's great. Never tried that before.